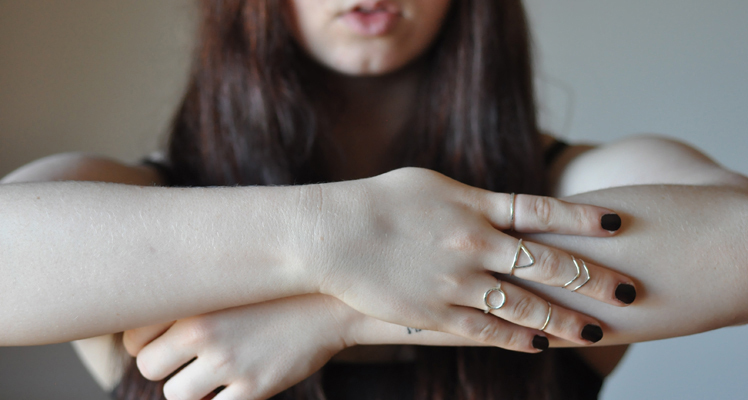 FK chats to Maria of beautiful minimalist jewellery label O Bliss Jewellery, based on the Gold Coast. Tell us a bit about O bliss jewellery and what products we can expect to discover? 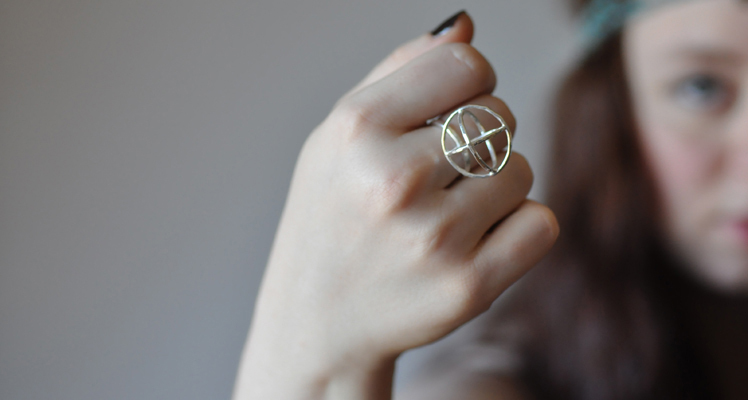 O bliss Jewellery presents hand formed sterling silver pieces that reflect a minimalist design aesthetic. Combining geometric shapes, brushed silver finishes, organic forms and rustic hammered textures, I create affordable studs, earrings, necklaces and rings. Along with my current range I also make one-of-a-kind pieces, so there is always something new to discover on my stall. I am proud to offer eco-friendly products; I buy my silver from an Australian merchant committed to minimizing environmental impact by recycling metal rather than using materials obtained from mines. What is your background and how did you start working with jewellery? I am a maker and a lover of art and design. Recently I have come to realise that I am also an entrepreneur at heart. I love every aspect of this creative venture: thinking, designing, sketching, playing, creating, photographing, promoting and finally, trading. I feel privileged that life has allowed me to pursue my passions. Upon completing a Bachelor of Visual Art in my early 20’s I spent 10 years working as a self-employed potter and for the past 8 years I have worked as a high school art teacher, happily pouring my creative energies into inspiring the next generation of artists. Two years ago I serendipitously stumbled into a one day silversmith workshop and was immediately hooked. My creativity found new life in silver and O bliss Jewellery was born. I have been creating for over 20 years, working across a diverse range of mediums including collage, painting, ceramics and photography; and as an art teacher I am immersed in all things art. I therefore bring a well-defined personal aesthetic to the O bliss label. 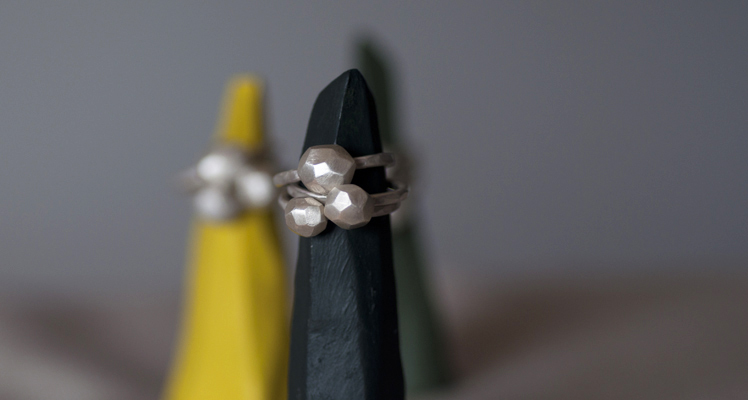 I have deliberately limited myself to sterling silver, which I feel has endless possibilities and find myself focusing on the interaction of shape, form and texture. Nature, abstract art and minimalist design are a constant source of inspiration. My studio is a 6m x 2m space situated right next to the family room. 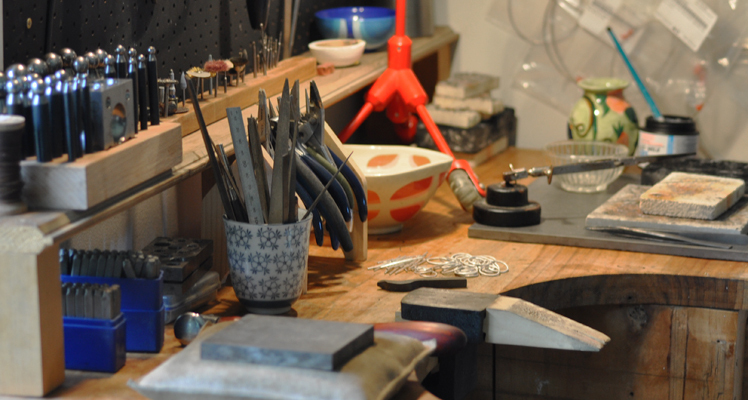 I love that I can tinker away at my jeweller’s bench while chatting to my husband and children. I work best with music playing and find inspiration in my collection of art and craft by friends and family as well as local and international talent. 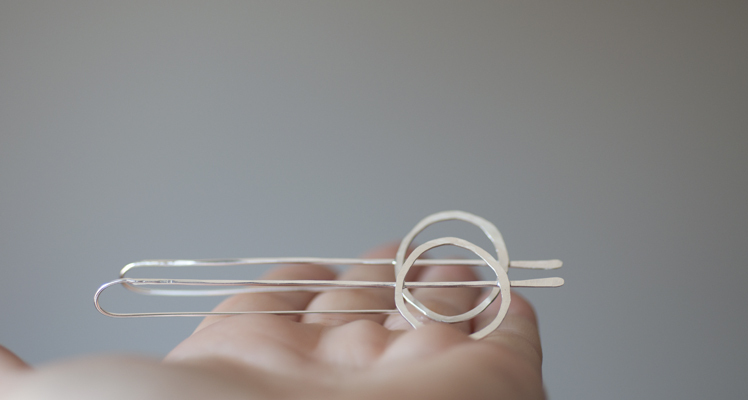 I am constantly thinking about jewellery and carry a notebook to jot down ideas as they form; however, my favourite designs have emerged through play. Working at my bench I become fascinated with the minutia: the elegance created by a filed edge, the change in texture from a few extra taps of the hammer, the organic shapes that materialize when silver scraps melt into a ball – these present quiet moments of inspiration and pleasure. Time is my biggest challenge. My life has become a juggling act of family, teaching and O bliss Jewellery. I did not set out to create a business. In January 2012 I opened an Etsy shop with 10 items that I had made during silversmith classes, with the hope of financing much needed tools and supplies. They sold and I made more. Sending my work to Etsy customers all over the world is a constant buzz and the face to face interaction with customers at local design markets has become invaluable in the development of the O bliss label. 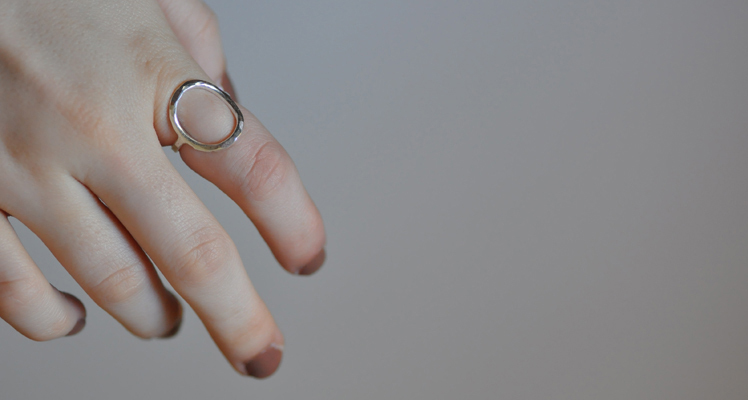 O bliss Jewellery is still in its infancy and is slowly forging a little place for itself in the Australian art and design scene. Like all designers, my greatest aspiration is to innovate and bring something fresh to the marketplace. 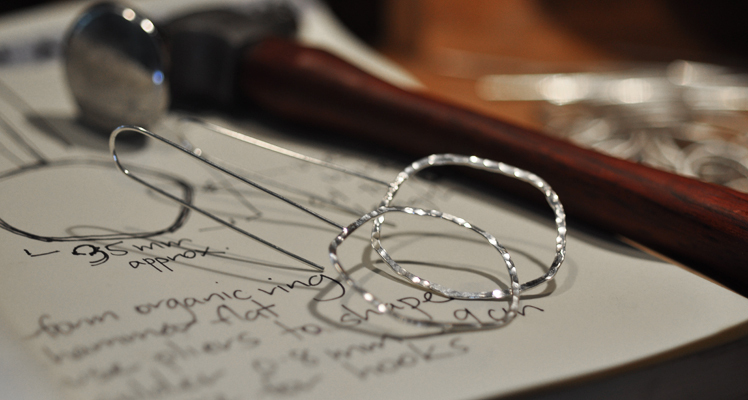 As my silversmith skills have developed, my design ideas have become more complex. The potential of working in metal both inspires and motivates me. In my journey thus far I have followed my instincts and have been overjoyed by the positive response. There is a growing demand for quality handcrafted design and I see a bright future for O bliss Jewellery and independent creative enterprise as an industry.